VOGA Pinot Grigio is an opulent, elegant example of what true Italian Pinot Grigio can, and should, be. VOGA Pinot Grigio is delicious as an aperitivo, pairs well with light seafood and chicken breast and has the structure to stand up to rich, creamy pasta and full-flavored dishes. A flawless match with sushi! Full of surprises, VOGA Rosa in a nice chewy, savory rosè with a silky, bright dry-yet-fruity light to medium body perfectly suited to accompany a hearty meal. Enjoy VOGA Rosa with eggplant pizza, smoked gouda mushroom quesadillas, fried cauliflower with whipped feta or a shrimp, avocado and roasted corn salad. Perfect match to the heat of a crispy fish taco with jalapeño sauce. VOGA Sparkling Rosè of Pinot pours the color of a sunset sparked by vivacious bubbles. Delicious on its own, VOGA Sparkling Rosè of Pinot Grigio is pairs well with light seafood and soft cheeses. VOGA Sparkling Rosè of Pinot Grigio is available in a miniature 187ml single-serve size – perfect for entertaining, weddings and events! 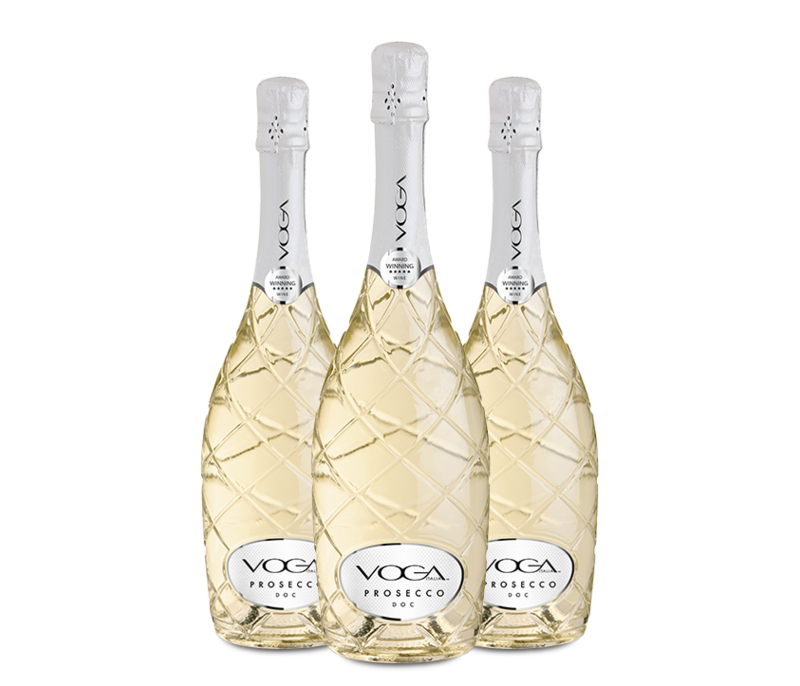 VOGA Moscato with its vibrant flavors and delightful frizzante character are absolute refreshment. VOGA Moscato is a stand out with desert, from fresh summer berries to juicy fall apples, lemon meringue pie and fruit-filled cobblers. The naturally sweet fruit flavors make is the perfect complement to spicy Asian cuisine. VOGA Moscato is available in a miniature 187ml single-serve size – perfect for entertaining, pre-gaming and events! One sip of VOGA Red Fusion is all you need to taste the hot sunny terroir of southern Italy in this complex, finely balanced, food friendly red blend. Pair VOGA Red Fusion with dishes that have equally big, bold flavors. Think steaks hot off the grill, bacon cheeseburgers, blue cheese, lamb, BBQ, short ribs, pizza topped with portabella mushrooms or a classic wedge salad. The innovative spirit of VOGA Italia is unmistakable in our stylishly adorned VOGA Prosecco bottle while the Brut wine inside is crisp, clean, refreshingly full-flavored and sure to please. Delicious on its own, VOGA Prosecco takes the guess work out of food and wine pairings. Highly versatile, it’s the perfect match to a wide variety of foods from seafood to cream sauces to Asian flavors. Perfect with eggs, it’s a natural for brunch. Enjoy with antipasto platters or just snacking on almonds, chips or even buttery popcorn. Impeccable with cobblers, pies, cookies and birthday cake, VOGA Prosecco in a natural, crowd-pleasing choice for any occasion. Use our store locator to find a retailer near you. Don’t see a location convenient to you? No problem, we’re happy to help. Click on the Contact Us button and drop us a note with your city, state and zip code. Sign up to get the latest on VOGA Italia tasting events near you and more! ©2019 ENOVATION BRANDS, INC. | ALL RIGHTS RESERVED | P.IVA 01871110233 | PLEASE DRINK IN STYLE RESPONSIBLY.